My first time wandering the streets of Cologne was a magical moment. In between dramatic cathedrals and luscious chocolate factories, I slipped from one brewery/pub/restaurant to another sampling Kölsch, the beer of Cologne. The waiters (or Köbes as they are called) serve the beer in a tall, narrow 200-mL glass called a Stange. With each additional delivery, they make a mark on your beer coaster, indicating the number of beers you’ve been served and how much you owe when done. They continue to bring beer and make more marks around the perimeter of the coaster until you put the coaster on top of the glass to indicate you are finished. I sat in the first pub for quite some time, as I enjoyed watching the parade of marks march their way around the perimeter of the coaster like a formation of skinny ants. 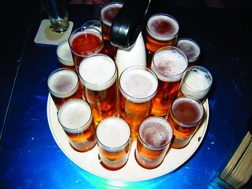 Kölsch, according to the Kölsch Konvention, can only be called Kölsch if it is brewed in the Cologne metropolitan area. The Kölsch Konvention also demands that the beer must be pale in color, be top-fermented, hop-accentuated, highly attenuated and between 11 and 14 °P. Of course, as any good brewer knows, that still leaves considerable wiggle room. While the different breweries do produce beers with a range of character, it is interesting to note how small a range of characteristics they span even though the Konvention technically allows much more. In today’s bold craft beer landscape, Kölsch is a relatively subtle beer. It is very pale gold to light gold color with a light grainy malt character and a soft mouthfeel. A few examples have a slight touch of malt sweetness up front, but all follow through with a crisp enough finish that the beer never really seems sweet. Hop bitterness ranges from medium-low to medium, usually resulting in an even balance. Drier beers may seem a bit more bitter in the balance, and sweeter versions balanced even to very slightly sweet. Hop flavor and aroma are generally low to non-existent, but there are some examples where noble hop character is apparent. A mistake some brewers make with Kölsch is to take any mention of fruitiness in the BJCP style guide and use that as carte blanche to brew really fruity beers. While there is some fruitiness, in most good examples it is very subtle. In Kölsch, fruitiness should be a character left more to the imagination rather than being outright obvious. When sampling your own Kölsch, if your first thoughts are about the fruity character, then it is way too much. The same can be said for sulfur. During cold fermentation, if activity is slow, the beer will end up retaining unacceptable levels of sulfur. Yes, you might find some sulfur in a few examples of the style, but I would argue that you won’t find it in the best examples. Make sure your fermentation procedures minimize the production of fruity esters and sulfur. I prefer a nice German Pilsner malt for brewing Kölsch. I have used other pale malts with acceptable results, but the light, grainy taste of high quality Pilsner malt is right on target for this style. That is all you need for a great Kölsch. You can enhance the malty flavors with a small addition of Vienna or light Munich malt, but keep the percentage to 5% of the grain bill or less. Using these malts can also make the beer too dark. You don’t want to overdo the clean, restrained malt flavors of this beer and you never want to add additions like caramel malts. The sweetness and flavor of caramel malts will quickly overwhelm the intended light character of this style. In the past, a number of sources suggested that Kölsch-style beers were made with a sizable portion of wheat malt, up to 20%. The current Beer Judge Certification Program style guidelines correctly indicate that this is rare in authentic Kölsch. A small portion of wheat malt is OK; the same as adding Vienna malt. Wheat can add a gentle bready note to the beer and can improve head retention. Overall, try to keep it simple. Limit yourself to no more than one grain in addition to the base malt and keep that to no more than 5% of the grist. A single infusion mash around 149 °F (65 °C) strikes the proper balance between fermentable and non-fermentable sugars. Extract brewers can use a Pilsner-like malt extract, although in a pinch any light colored extract will suffice. Most light colored extracts will attenuate fairly well, but try to avoid any extract that won’t attenuate in the vicinity of 80% apparent attenuation. There are several good Pilsner or Pilsner-type extracts out there, so finding a good extract should not be too difficult for most brewers. Target a bitterness-to-starting gravity ratio (IBU divided by OG) between 0.4 and 0.6. You’re trying to achieve an even or very slightly sweet start to the beer, with a balanced overall character, and a slightly dry finish. Normally, a single addition at 60 minutes is all you need. If you want a beer with some hop character, a moderate later addition, say 1⁄2 ounce (14 g) 20 minutes or later is acceptable. Hop choice for bittering and flavor is fairly flexible. Ideally, stick with German noble hops Hallertau, Tettnang, Spalt or Hersbrucker. If you’re having trouble sourcing those, any German hop will work as will US versions of traditional German hops. Overall, think German lager hop character, not West Coast pale ale character. Never use citrusy or catty American-type hops. Yeast selection and fermentation temperature control is very important. It is impossible to get the right flavor and aroma without the right yeast at the right temperature. You want the beer to attenuate enough so that it doesn’t have a sweet finish and you want to ferment it cool enough that any esters are restrained and the beer has a fairly clean character. Two great yeasts for this style are White Labs WLP029 German Ale/Kölsch and Wyeast 2565 Kölsch. You can’t go wrong with either product. These yeasts provide the right, low-ester profile and proper attenuation for a dry enough finish. No matter what yeast you choose, however, you’ll still need to pitch the proper amount of clean, healthy yeast and keep a close eye on fermentation temperatures to ensure good attenuation and flavor development. Fermentation temperatures around 58 to 62 °F (14 to 17 °C), depending on strain used, is a good range. One thing to keep in mind about most Kölsch yeasts is that they do not flocculate easily. It can take quite a bit of time, finings or filtering to clear the beer, and it is important for the style to be brilliantly clear. If you’re patient, the easiest way to clear the beer is to lager it near freezing for a month or more. Kölsch’s delicate character won’t hide flaws, like oxidation or poor fermentation practices. Pay strict attention to sanitation, yeast health, and treat your beer gently during transfers. After lagering and as soon as the beer reaches its peak of flavor, it is time to start thinking about consuming the beer fairly quickly. Kölsch is best served fresh and around cellar temperature. If you can serve your Kölsch in a tall, narrow, straight-sided glass, it will also make a difference in your perception of the beer. The all-grain version of this recipe uses a small amount of Vienna malt. While you can try steeping 0.5 lb (227 g) of Vienna malt, the problem is that it will add unconverted starch to your beer. It is better to omit it or use extract instead. I don’t know of any Vienna malt extracts, so Munich or wheat extract is the best substitute. Many folks have a hard time sourcing 100% wheat or Munich extract (Weyermann makes a 100% Munich malt extract), with most being a blend around 50/50 or 60/40. However, all is not lost. Just count the non-Munich or non-wheat portion of the extract against the base malt. For example, if a recipe called for 1 lb (0.45 kg) of 100% Munich and you had a 50/50 blend instead, increase the amount of Munich extract to 2 lb. (0.9 kg) and lower the base malt amount by 1 lb (0.45 kg). Mix enough warm, chlorine-free water and the malt extract to make a pre-boil volume of 5.9 gallons (22.3 L) and a gravity of 1.041 (10.2 °P). Stir thoroughly to help dissolve the extract and bring to a boil. The total wort boil time is 60 minutes. Add the bittering hops once the wort begins to boil. Add Irish moss or other kettle finings with 15 minutes left. Chill the wort rapidly to 60 °F (16 °C), let the break material settle, rack to the fermenter and aerate thoroughly. Use 2.5 liquid yeast packages or make a starter with fewer packages. Ferment at 60 °F (16 °C). Allow the beer to lager for at least four weeks before bottling or serving. When finished, carbonate the beer to approximately 2.5 volumes and serve at 50 °F (10 °C). Mill the grains and dough-in targeting a mash of around 1.5 quarts of water to 1 pound of grain (a liquor-to-grist ratio of about 3:1 by weight) and a temperature of 149 °F (65 °C). Hold at 149 °F (65 °C) until enzymatic conversion is complete. Raise the temperature to mash out at 168 °F (76 °C). Sparge slowly with 170 °F (77 °C) water, collecting wort until the pre-boil kettle volume is around 6.5 gallons (24.6 L) and the gravity is 1.037 (9.3 °P). The total wort boil time is 90 minutes, which helps reduce DMS levels in the beer. Add the bittering hops with 60 minutes remaining in the boil. Add Irish moss or other kettle finings with 15 minutes left in the boil. Chill the wort rapidly to 60 °F (16 °C), let the break material settle, rack to the fermenter and aerate thoroughly. Use 2.5 liquid yeast packages or make a starter with fewer packages. Ferment at 60 °F (16 °C). Lager for at least four weeks before bottling or serving. When finished, carbonate the beer to approximately 2.5 volumes and serve at 50 °F (10 °C). Mill the grains and dough-in targeting a mash of around 1.5 quarts of water to 1 pound of grain (a liquor-to-grist ratio of about 3:1 by weight) and a temperature of 149 °F (65 °C). Hold the mash at149 °F (65 °C) until enzymatic conversion is complete. Raise the temperature to mash out at 168 °F (76 °C). Sparge slowly with 170 °F (77 °C) water, collecting wort until the pre-boil kettle volume is around 6.5 gallons (24.4 L) and the gravity is 1.038 (9.6 °P). The total wort boil time is 90 minutes, which helps reduce DMS levels in the beer. Add the bittering hops with 60 minutes remaining in the boil. Add the Irish moss or other kettle finings and the late hops with 15 minutes left in the boil. Chill the wort rapidly to 60 °F (16 °C), let the break material settle, rack to the fermenter and aerate thoroughly. Use 2.5 liquid yeast packages or make a starter with fewer packages. Ferment at 60 °F (16 °C). Allow the beer to lager for at least four weeks before bottling or serving. When finished, carbonate the beer to approximately 2.5 volumes and serve at 50 °F (10 °C). Altbier is the famed beer of Düsseldorf that translates to “old beer” in English. But this old beer is nothing like an English old ale. Learn its distinguishing traits and pointers to brew one. The fruited Berliner weisse beers have developed a relatively small, but devoted following. One homebrewer dives down this rabbit hole after getting enamored by one brewery’s version and wants to share his experience.